In 8-inch skillet, melt 2 teaspoons of the butter over medium heat. Add shallot and mushrooms; cook and stir 1 minute or until tender. Remove from skillet. To same skillet, add remaining 3 teaspoons butter and the oil. Add pork; cook 8 to 10 minutes, turning slices halfway through cooking, until browned and no longer pink in center. Sprinkle with salt and pepper. Remove from skillet; cover to keep warm. Gradually add cognac to same skillet; stir in mustard and cream. Heat to boiling; boil 1 to 2 minutes, stirring constantly, until slightly thickened. Add mushroom mixture; cook 1 minute or until thoroughly heated. 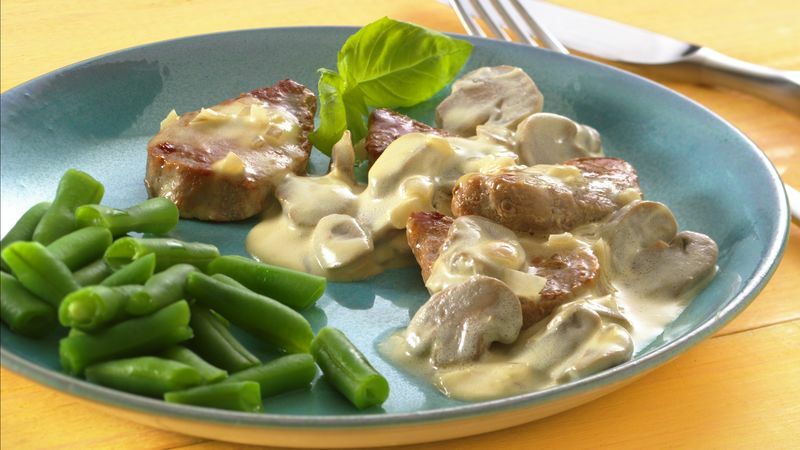 Serve sauce over pork slices; garnish with thyme.